Seaweed. It's as old as time and as ubiquitous as grass, but could it be a slippery solution to some of our problems? I am slip-sliding across an alien landscape. Jagged red rocks zigzag across a grainy surface, their edges softened by mile upon mile of what looks like fluorescent green slime. The ground crackles underfoot, plants popping as I race over them. I am in pursuit of Jonathan, a slender man buzzing with exuberant energy as he leaps from rock to rock, peering at the plants, cutting off choice sections and examining them in the pale morning sunshine before stowing them in his bag. 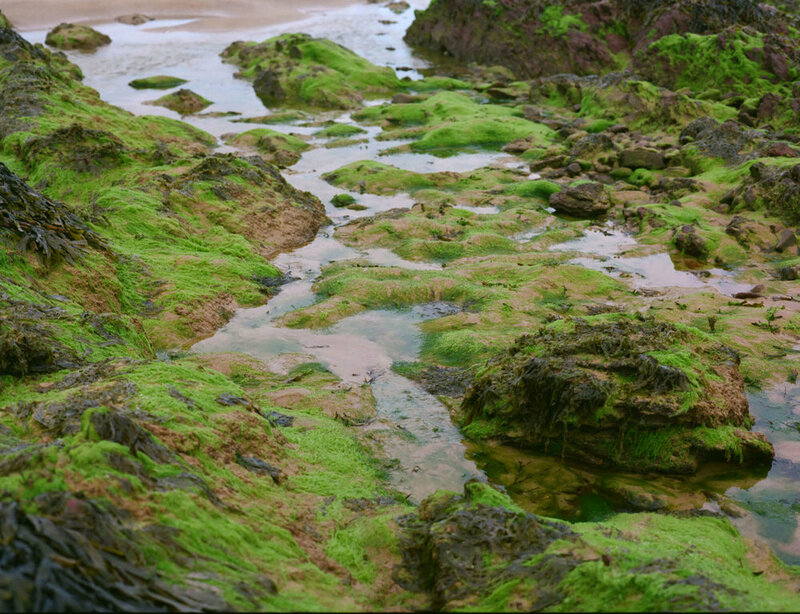 This beach at low tide is a fertile forest of greens and reds and browns, strange and beautiful and so primordial that I half expect to see a dinosaur plodding along. To me, a lifelong metropolitan, the plant life seems otherworldly, fantastic. To people who live on this coastline, and others like it around the world it must seem quite mundane. So mundane, in fact, that it is ignored across much of the planet. Seaweed is the sliminess you'd rather not find on the rock as you stretch out to sunbathe, the annoyance clinging to the ropes of your fishing boat as you haul it in, the eyesore on the unspoiled beach. But it is beginning to look like it might also be our salvation. The Japanese have been on record as eating seaweed from the 4th century, the Chinese from the 6th. Koreans and southern Chileans have always included it in their diet. 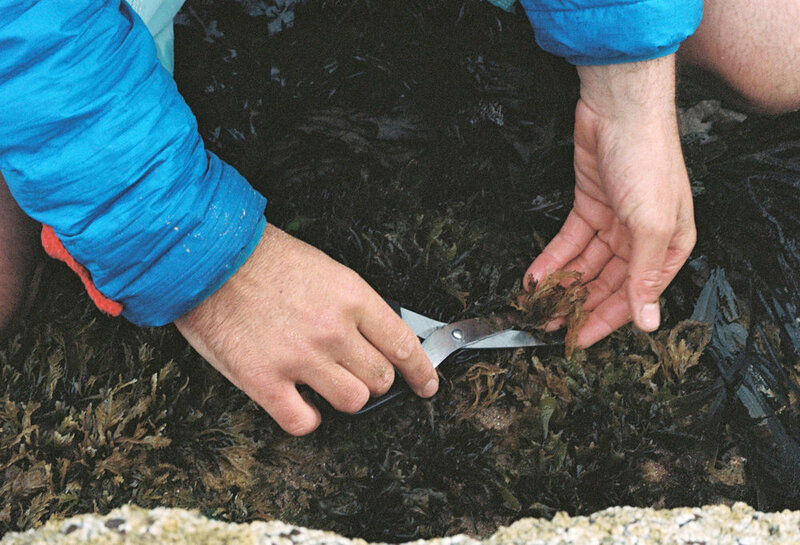 In Ireland, Scandinavia, Maine and here in West Wales, dulse kelp and laver have been foraged since time immemorial. But seaweed - outside of Asia - has always been a somewhat niche foodstuff, the preserve of Asian restaurants and health food shops. Now, however, it seems to be the latest humble plant to be rebranded as a superfood, and a gourmet one at that. I am here chasing Jonathan to photograph him and his world for Liberty, the exclusive London store. For the first time they are opening a food section, and alongside fine wines, small-batch gin and artisan preserves will sit Jonathans scavenged seaweed, under the monicker Pembrokeshire Beachfood. Jonathan grew up here in Pembrokeshire and left to explore the world, but found himself sometime later in Swindon, middle England, working a desk job and craving freedom. "I knew I needed to get back here, to the sea and the wildness" he says, "I knew I wanted to do something creative, and to do with the sea, and then I thought about all these beach foods and how unknown they are elsewhere... here, try this" he says, plucking a frizzy brown tendril from between the barnacles. It looks vaguely pubic, and very unpromising. "It tastes like.... truffles?" I feel silly saying it, for it looks so much like it ought to taste of greenness, grit and the sea. But it does. Woody and buttery and almost indecently rich. Later, I watch Jonathan boiling the morning's pickings of laver while he fries me laver bread from yesterday's haul, served with spicy seaweed ketchup and locally foraged mushrooms. The bread is warm and comforting, as neutral as bread or potatoes but with a pleasingly savoury taste, a mineral cleanness. After the early start, and with the August morning sun warm on my skin, it's the best breakfast I've ever had. It may well have been one of the best for me too. Like its green relatives on land, seaweed is highly nutritious. The kind of food that inspires the name "mineral powerhouse" and "superfood", with its makeup writ as large on the packaging as it is hidden in shame on the chocolate biscuits. Nori can be 47% protein, while other species vary between 7 and 35 percent. It is high in fibre and free from cholesterol; rich in sodium, magnesium, iron, vitamin c and vitamins K and A. It is the best plant-based source of Vitamin B12. Studies as to the health benefits or otherwise of seaweed are scarce, but inverse associations have been made between seaweed consumption, and vast swathes of cancers and other serious conditions, both physical and mental.1It is high in protein and almost fat-free. Perhaps more importantly in these unpredictable times, it doesn't require rain, has few predators, and could supplement the vegetation grown on land to help feed the masses. Along coastal Africa it grows with gay abandon, but is almost ignored. Yet in straitened circumstances, these neglected weeds could turn a meagre bowl of rice into a well balanced meal. It seems strange that something so nutritious and full of flavour should be so slow to cross the continents in the way that spices have done for centuries. For a long time, in the UK, 'Crispy Seaweed' was a dish on Chinese menus actually made of cabbage. Sushi and the seaweed synonymous with it arrived in LA's little Tokyo in 1960, and gradually grew in popularity. In the UK and Europe, it first appeared in the 80s, and became popular and then ubiquitous in the 90s. But seaweed in this context was only the wrapping on the roll. The roasted strips of seaweed which are still the most common form of the plant in the West arrived in supermarkets in the last decade. Other more, well, seaweedy forms of the plant are only beginning to slide onto our supper plates now. Its certainly an acquired taste, but so are many things which become part of our lexicon once we've let them in. 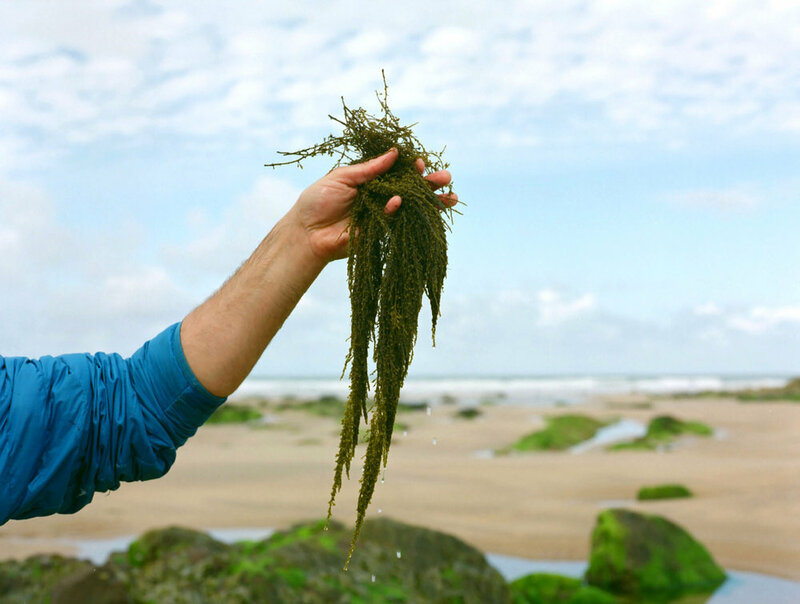 Alongside its culinary uses, seaweed extracts are used to fertilize and are added to animal feed; they thicken our foodstuffs and fill out a vast amount of beauty products. But in the last few years, seaweed seems to have slipped out of its slimy underdog role, and into the forefront of technological innovation. Nate Petre, an American Ph.D. candidate at Imperial College in London, is sweating under the heat of three 3d printers in a small disused kitchen of the college, and the air is acrid - it's not an unpleasant smell, just a little strange and out of place here. It smells almost like.... burning seaweed. Nate grew up exploring the intertidal zone in cape cod and surfing in California during his peripatetic US childhood. He was working on a design manufacturing Ph.D. in London, printing parts for motorbikes, when he started to look for something to take him back to the waves. "Life in London really made me long for the ocean. There's something about being in the sea which feels like an electronic jump start. Something gets into your body's electricity and..... 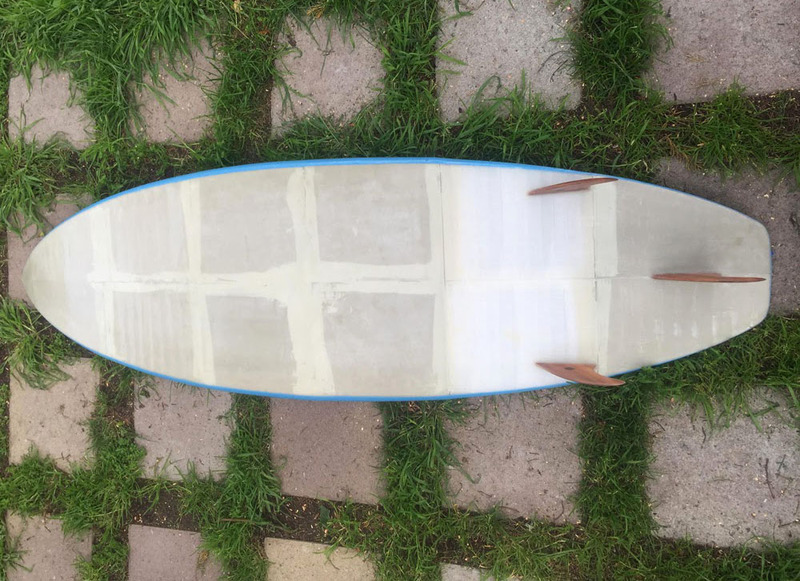 I started thinking I needed to surf, but could I avoid paying for a surfboard? - it became a mental exercise to think about building one". When Nate met Jeff Halmos, a fellow ocean devotee with a similar dream, the two set out to build a compostable surfboard. "In researching, I stumbled across a company called Algix who were skimming lakes and ponds in Alabama and Mississippi, where industrial farming and climate change had resulted in large hypertrophic algae blooms. That's microalgae - seaweed is macroalgae and these are little microorganisms. They basically made a sieve which came along and dried them out. They fermented them a bit to create a long chain polymer and then turned them into pellets, which they then turned into a printable filament. I converted a surfboard shape into printable pieces, almost like lego - when all of these parts are printed they'll slot together". He pauses to remove a printed part, a small piece of this puzzle. It is greenish grey and a strange combination of manufactured and organic, and still has the not unpleasant toasted marine aroma. "I've found someone else who's made a resin made from pine sap to coat it" he continues. "Once you're done using it and put it in landfill, it will turn back into plant waste in 5 years, versus a regular surfboard which could take 300 million, with the natural order of things. We call it planted obsolescence. Plant it and it will eventually return to plant form"
Nate Petre's first prototype for his 3d printed algae surfboard. It is clear that surfing is his passion, but Nate is equally excited about the bigger potential of the exercise. "In places like the Carribean, which are prone to hurricanes, but also have a bunch of seaweed... with more research and setting up local manufacturing you could, for example, prototype a hurricane safe roof tile - something far aerodynamically superior to a tin roof. When a hurricane blows through, there's a pattern of richer economies donating a lot of cheap material to rebuild. And the locals are hamstrung, with no ability to buy or rebuild for themselves. Seaweed could answer both problems. You can grow the materials to make roof tiles, and the fittings for solar panels and so on, and with a roof that doesn't blow away, you're not always chasing that tail"
Potentially then, we have a building material which grows all over the world and which, if harvested, regrows at a rate of up to half a metre a day. Which is biodegradable, and which doesn't eventually become part of the enormous global problem of plastic waste. In Indonesia, a company of equally impassioned scientists and designers under the name of Evoware have recently started to sell seaweed based edible drinks containers and food packaging. Indonesia has a huge plastic waste problem, with 90% of discarded plastic ending up in the ocean, of which 70% is food and drink cartons. Like Nate's roof tiles, Evoware could kill two birds with one stone - eliminating the waste plastic clogging up the ocean, and bringing trade and profit to poor seaweed farmers. It's a win-win situation, and so appealing to think that the seaweed floating in the shallows may help to eliminate the plastic currently crowding it out. Back on the beach in Wales, I watch the waves as they come in and cover the rocks. Seaweed tangles around my feet, looking as slimy and unprepossessing as it ever has. And isn't there something wonderful in that - the least promising of lifeforms suddenly offering us solutions to global problems. It seems that soon we will be able to drive seaweed powered cars and shelter under seaweed roofs. My phone beeps with a message from Nate, a video just in from the US. A group of surfers out on a California morning, the mist just clearing in the pale clean light. A girl catches a wave, turns, seems to dance on the water. The ocean roars beneath her, lifting her, dancing with her. Her face is ecstatic. Under her feet, the puzzle-piece board glides smoothly into the future.